Most people assume that the effects of climate change are going to be felt through another big disaster, like Hurricane Katrina. Not necessarily, says Minik Thorleif Rosing, a top geologist at Denmark’s National History Museum and one of my travelling companions. ‘Most people will actually feel climate change delivered to them by the postman,’ he explains. It will come in the form of higher water bills, because of increased droughts in some areas; higher energy bills, because the use of fossil fuels becomes prohibitive; and higher insurance and mortgage rates, because of much more violently unpredictable weather. Remember: climate change means ‘global weirding’ not just global warming. 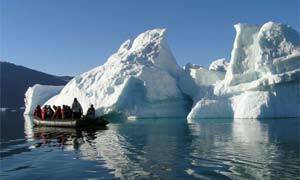 Commentary: Global warming has its own language | Environment | The Observer .